Written into the contract for the Navy’s newest combat aircraft training system is a requirement for industry bidders to use a government-established standard communication software architecture. The $142 million contract holds Rockwell Collins [COL] and Leonardo DRS to implementing the Software Communications Architecture (SCA) version 4.1 when building the Tactical Combat Training System Increment II (TCTS-II). Leonardo DRS is a U.S.-based unit of Italy’s Leonardo. The new training system, managed by Naval Aviation Training Systems Program Office (PMA-205), will provide an advanced airborne, ground and ship-based secure radio frequency-based training capability for the Navy and Marine Corps. Implementation of SCA 4.1 was worked into the contract by the Joint Tactical Networking Center (JTNC) “with the aim of effectively employing the open systems architecture tenets of Better Buying Power 3.0,” states JTNC’s standards director, Francis Van Syckle. “TCTS Inc. II fills gaps from the currently fielded air combat training equipment by enabling the world’s air forces to securely migrate to LVC training to increase warfighter readiness at a reduced cost,” said Troy Brunk, vice president and general manager of Communication, Navigation and Electronic Warfare Systems for Rockwell Collins. “As we develop the advanced training capabilities, we will be flight testing on our Eastern Iowa Range to reduce technical risk and time-to-field for the Navy.” LVC refers to live, virtual and constructive training. The initial $142 million TCTS-II contract is for the development of an airborne, ground and ship-based encrypted training capability. It will include integration with other fielded equipment and combat systems to support the training of U.S. Navy and Marine Corps aviation forces, including aircrew for F-35, F/A-18 and other front-line combat aircraft. Coupled with this initial development program are options for low-rate and full-rate production. The system provides the first certified, multi-level security (MLS) training equipment packaged in both airborne and ground equipment, allowing for tethered and autonomous operations, according to Rockwell. 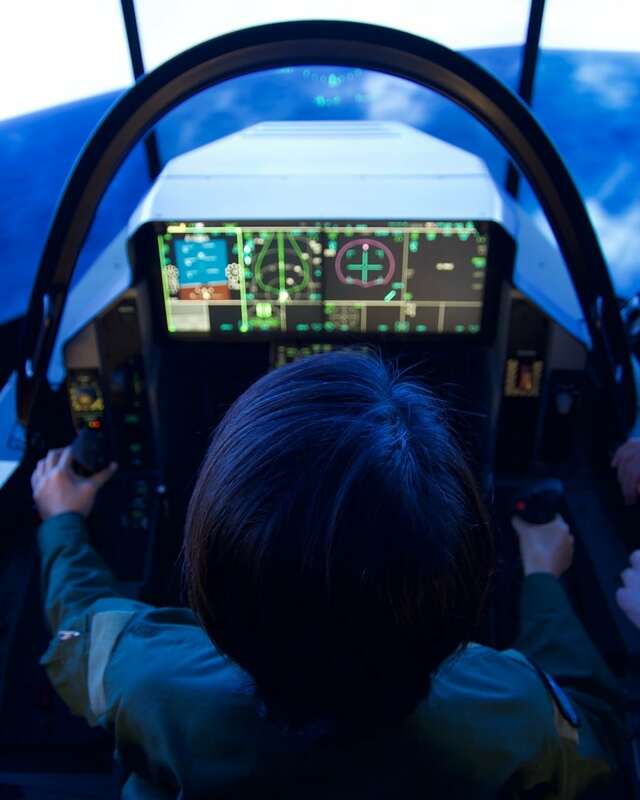 MLS provides secure interoperability between combinations of fourth and fifth-generation aircraft, allowing all participants to train in a simulated, high-threat combat environment. It has five times more network capacity than current air combat training systems while using the existing training range frequency spectrum for enhanced live player training fidelity and to increase the number of players participating in LVC training. The SCA is an open architecture framework that defines a standard way for radios to instantiate, configure, and manage waveform applications running on their radio hardware platform. By requiring SCA 4.1, the Navy is able to leverage the DoD’s investment in existing standard software while incorporating technology advances enabled with the latest version of the specification. The specification defines a common way to launch, control and configure a waveform software application, allowing the waveform software to be reused across multiple platforms. The JTNC supports the DoD’s goal of ensuring interoperable, secure, and affordable waveforms and wireless communication products by managing and maintaining its Waveform Information Repository, recommending standards, and conducting compliance and certification analyses. The JTNC performs technical analyses of candidate waveform information repository products that result in preliminary characterization of these products as to whether they meet DoD standards and policies for interoperable and secure joint tactical networking. The JTNC provides a validated open architecture framework that identifies standard non-proprietary interfaces that separate the waveform/network manager software from the radio set, permitting common waveforms and network managers to be deployed across multiple radio sets and vendors.